It was time to bid a fond farewell to Zion and hit the road bound for Page, Arizona! 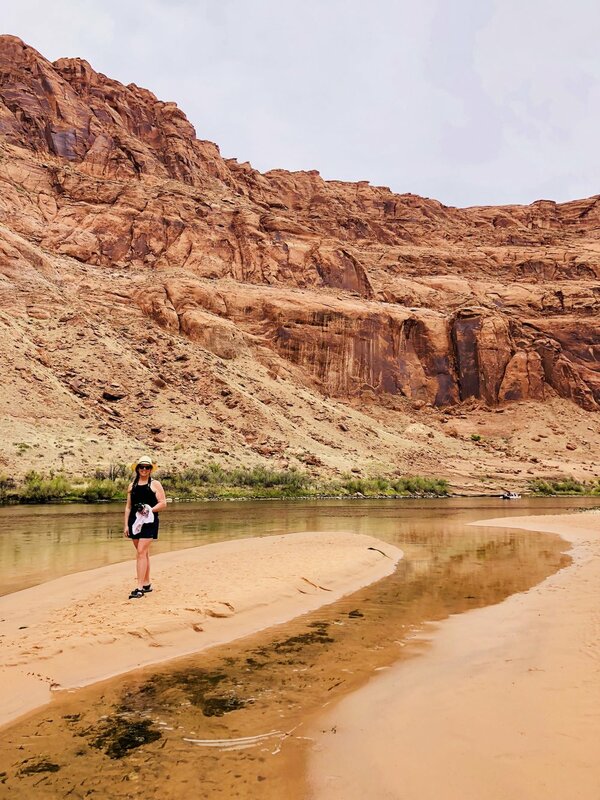 Page is home to Glen Canyon National Recreation Area which includes: Glen Canyon Dam, Lake Powell, Horseshoe Bend, and a 15 mile stretch of the Colorado River before it heads into the Grand Canyon. Page is nestled between tow National Monuments - Vermilion Cliffs and Grand Staircase Escalante, so needless to say there are plenty of amazing views to be seen around here. The view of Lake Powell as you descend down toward the Glen Canyon is mind boggling with a combination of glowing white and pink landforms surrounded by water so blue it doesn't seem real. The awe continues as you drive over the Glen Canyon Dam glancing down at the Colorado River way down below. Needless to say, Page and the outlying area is a wonderland for outdoor recreation! From boating and paddling, to hiking and climbing, there is so much to do and beauty to be found at every turn. the local economy is all about tourism and the small town of Page is focused on housing, feeding, and providing outdoor activity for the masses. The first thing I quickly figured out is to truly appreciate Glen Canyon I had to get out on the water. So I booked a Colorado River float trip, starting at the dam and winding its way 15 miles down river to Lee's Ferry. 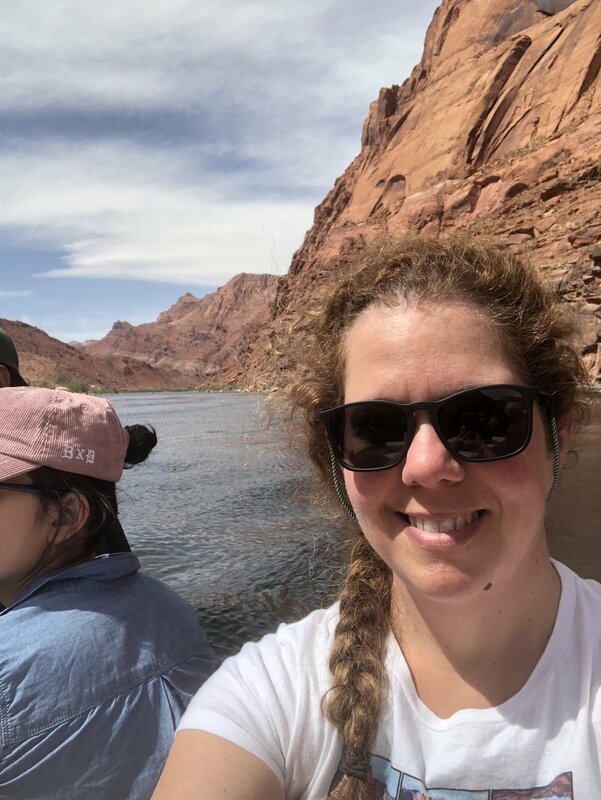 It was a perfect day - blue skies, a little breeze, fun companions to meet and share about my project with on the boat, and views of the canyon that are 100 times more amazing when seeing them from the water looking up! My guide Lindsay was full of cool facts about the area, the wildlife, and both Native American and Pioneer Settler history. The float trip took us through the famous 270 degree turn in the river known as Horseshoe Bend, which I had also hiked out to see from the top - as the edge that is accessible for viewing is on Navajo Reservation property, you could walk right out to the edge of the 100 foot drop to the river below - no fence or guard rails here! Many people were getting death-defyingly close to the edge to pose for a perfect picture (myself included I guess) while others had a harder time getting close enough to look down...this pair had to crawl up to the edge in order to see the view as the man on the right has an extreme fear of heights (made for a great photo, and a lot of cheering from the onlookers when he finally made his way to the edge! It is truly one of the most spectacular sights I have seen and had to head back the next day to paint from that very spot! 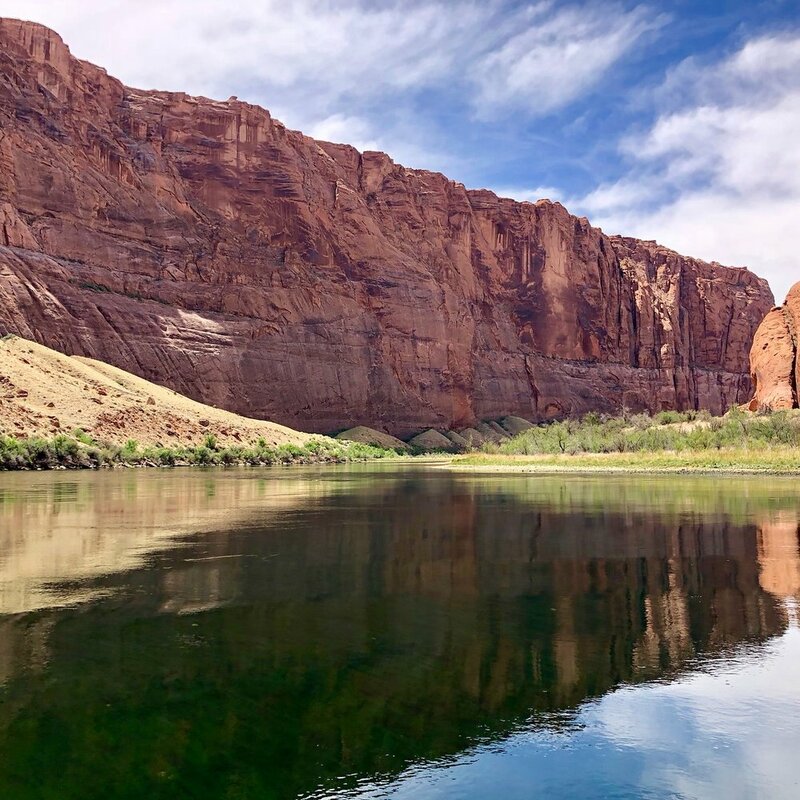 Glen Canyon National Recreation Area not only provides a destination for vacationers and locals alike to get out into the landscape and on the water, it also focuses on healthy water management, preservation of wildlife habitat, and protection of Special Native American Cultural sites. Unfortunately, in the post-9/11 world we live in here in America, the threat of terrorism is a high level concern here at Glen Canyon because of the Dam (which is only 16 feet smaller than the Hoover Dam in Nevada). The impact of a breach in the Dam due to a terrorist attack would impact hundreds of thousands of people as well as having a grave impact on the landscape. Therefore, now more than ever, a good share of the funding for this area has to be used for intensive security and screenings of tourists. That is leaving less funds available for staffing, land and wildlife management, and conservation. To answer this growing concern, there are a couple different local funds that are raising money to help suppliment the resources needed to keep this special place doing good work for the environment. After two great days hiking, boating, taking photos, and painting in the 90 degree sunshine, I headed south and west to the East Entrance of the Grand Canyon's South Rim...What a difference 4 hours and a huge elevation gain can make! I traded my tank top and shorts in for first Jeans and sweatshirt, then eventually a fleece,, wool socks, hat and gloves! Yes, winter was still hanging on at the Grand Canyon - it went from breezy and in the 40's (dipping into the teens at night) to a snowstorm on the last day of my 3 day visit! But adding on the layers and eventually giving in to a hotel room (I'm not that diehard of a tent camper!) was all a small price to pay for what is the most astounding view I have every laid my eyes on. There is a reason this is one of the seven modern wonders of the world and as much an American icon as the Statue of Liberty, your first view literally does take your breath away. If fact I just sat right there - no camera, no phone, no sketch book - I just looked and let it all sink in. Eventually a family came up behind me and took this picture. I think they could sense I was having a profound moment. Luckily she was kind enough to come up and introduce herself and texted me the photo she took. I am so grateful to this lovely family from Minnesota, this pictures sort of just sums it all up in one shot. Being brought to your knees by nature's creation. The first began with a 4:30am alarm to get myself up and out to catch the famed sunrise from Mather Point. With Sunrise slated for 5:38am, that didn't give me much time to throw on literally every item of clothing I brought with me, grab my camera and a headlamp, and set out for Mather with hopes of arriving before the color show began. When I arrived there were only a handful of dedicated fools like me braving the 16 degrees and bit of wind to capture the shot, but soon that all changed. As we closed in on 5:30 - more and more people flocked to a good vantage point, talking camera functions, regretting the one too many beers the night before, or cursing their parents that getting up at this ungodly hour was a "fun idea". There was instant friendship forged around huddling together to conserve body heat and who was smart enough to bring Kleenex for all our drippy noses! Suddenly the technicolor show began and between my camera, phone, and the hush of the crowd, I captured something that was a truly remarkable sight to behold. The post-rise comradarie was as fun and the event itself...Some folks came more prepared for the experience than others and I immediately gravitated to the crew of 5 twenty-somethings who were clad in their sleeping bags and were so prepared to enjoy the sunrise moment that they even brought along their French Press coffee pot to the viewing! This native of Flint Michigan was immediate kin to this group once I found out they were intact U of Michigan alums and had the chance to snap a couple great shots of them and share my story of Postcards from the Parks with them! Standing in that spot with that cross-section of people from all over America and the world all braving the hour and the cold to share one spectacular moment of awe, you can't imagine that we live in a country that is systematically trying to deregulate equally important public lands in the name of corporate gain and our need and greed for oil....but that is where we are and it will take all of us to stop it. My other cherished (and some what embarrassing) moment came when I arrived at Moran Point. This view point encapsulates the view from which Thomas Moran painted his most famous interpretation of the Grand Canyon from his expedition of the area with john Wesley Powell in 1873. Via wooden boat and mule, Moran sketched and painted the wild landscape as Powell surveyed the wilderness. I have long been a fan of Moran's work since my undergrad years at University of Vermont where I was a double major in studio art and art history. He later became a hero of mine as I connected his work to his core beliefs and passion for recording and preserving of the landscape. But it wasn't until I was standing before the actual view and reading the tribute plaque to Moran and the impact his work had on protecting so many areas of now National Park lands that I realized that I was intact, in my small way, truly doing the same. With the help of many, a very supportive family, some courage combined with a bit of recklessness, and a leap of faith for the greater good, I was embodying the Moran ideal of Chronicling the Landscape for other to see, appreciate, and protect as a female artist of 2018 - 145 years later. Yes, I cried, and yes I completely confused a lovely Dutch family who came upon me at the wrong moment as I tried to explain that all was well and I wasn't about to leap to my death. We laughed, tears spilled, and I grabbed my sketch book...There is great work still to be done! Thanks to all of you for your support and helping me to share this project and these great places! Newer PostJoshua Tree National Park!